Rescuers scrambled Saturday searching for survivors and carrying bodies away from the debris after a series of earthquakes and a tsunami struck the Indonesian island of Sulawesi. 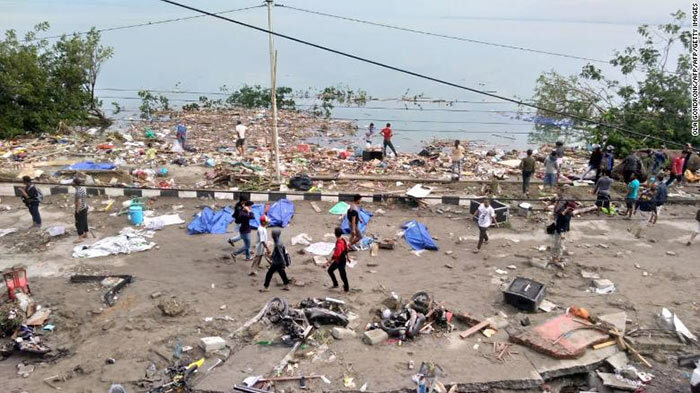 Thousands of buildings either collapsed or were swept away by water in Palu City, leaving scores trapped in the debris, sleeping outdoors or severely wounded. At least 48 people have died since Friday and authorities are warning that the death toll may substantially rise in the coming days, Indonesia’s Disaster Management Agency spokesman Sutopo Purwo Nugroho said. Sutopo said electricity and communications have been cut off, making it difficult to assess the damage not only in Palu but also in the nearby fishing community of Donggala. More than 350 people are being treated in several local hospitals in the midst of the massive destruction in Palu. After a local hospital was severely damaged, medical officials opted to treat dozens of wounded residents just outside the building, Nugroho said. Authorities are urging residents to not go inside their homes and sleep away from building on fields, roads or yards because of possible aftershocks. The horrific scene began Friday when the first in a series of tremors was felt at 3 p.m. (4 a.m. ET) 35 miles north of Palu, according to the United States Geological Survey. A 7.5 magnitude tremor — the largest shock recorded Friday — triggered a tsunami that hit beaches in the cities of Palu and Donggala, officials said.